When I first laid eyes on this brewer, visiting Oren and Nancy Bloostein, I thought it was a teapot. Elegant, it was attractive. Maybe I thought it could serve coffee, but who transfers coffee from the brewer to the server anymore? Oren insisted I take it home and try it out. All the way home all I could think about was the opportunity to try out a new technology. I’m beginning to think there are two kinds of coffee brewers, those that utilize stillness, the steepers such as the press pot, and those that utilize motion such as drip, vacuum and, at the far end, espresso. The SoftBrew is definitely a steeper. It is simply a carafe, albeit a sleek one, and a patented screened cylindrical filter. What separates it from the press is the lack of press. There is no plunger to push down. According to the directions, you simply toss your grounds into the cylinder and add near-boiling water. After between four and eight minutes (quite a range), you simply pour your coffee. They make a variety of sized models. The one I tried is, I believe, a four-cup version. The first time I tried it, I was happy with the results. As it was Oren’s Daily Roast Sumatra I’d purchased on the way to my train (yes, I took Amtrak home) it was very, very nice. 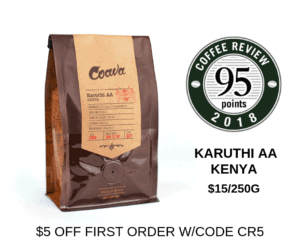 It had what I’ve come to expect from a steeped method: Low acidity (even for a Sumatran), a rich, burnished acidity – almost hot-cocoa-like in its texture. I couldn’t help but try to make it do more in terms of matching a high-temperature vacuum brew. For my second batch I scalded the pot with boiling water, then added the grounds and near-boiling water to see if a raise in brewing temperature might change the flavor profile. It did, but not to the good, in my opinion. As is my procedure when testing, I brewed using the SoftBrew a variety of ways for the next two weeks. After this battery of tests, conducted while monitoring the contact temperature, I ended up noting my most satisfactory flavor by not preheating the pot. In fact, the most casual method yielded my best results. I noted that using this meant that the majority of contact time the coffee brewed at well under industry-standard temperatures. I also found that above-average grounds portions gave me the best flavor without any noted bitterness. When using less grounds and maintaining the brewing temperature at between 195°F and 205°F I detected a strong sharp entry note. Using more coffee and a lower temperature, this note disappeared. I urge anyone to conduct their own test. It was unsubtle. I used a contact time of 4 minutes. By that, I mean I poured my first cup at four minutes. Since there is no press to consolidate the grounds on the bottom it can be argued that the SoftBrew never really stops brewing, although certainly as the coffee cools, the brewing slows significantly. I did not find the second cup appreciably different than the first, other than it was slightly cooler. Around the same time, a shipment of Sumatra from Paradise Roasters arrived on my doorstep. This coffee, as you know, is rated 94 by Ken Davids. This coffee was actually rather finicky to brew in some machines. I preferred it in the SoftBrew to its flavor in the highly-rated Technivorm. It just tasted more right, it’s balance was there and the spice and vegetal note were what the review promised. In comparing the Paradise Sumatra with Oren’s, the Oren’s did not exhibit the vegetal note. Oren told me he eschews Sumatrans that present that particularly flavor. It’s just personal preference. Both coffees reached tasted their best in the SoftBrew. I still prefer some coffees in other methods. My tests using Open Sky Coffee’s Columbia Fair Trade just tasted lackluster compared to its showing in my commercial Bloomfield brewer. The only other thing worth noting is the patented cylinder. Yes, it is easy to clean and does the same thing as the press in the press-pot. But, the one thing I want to point out is there is more sediment than I expected, and probably more than I prefer. This brewer exhibits a high degree of sediment in the cup, nothing such as boulders or large grounds, but never anything resembling a cloth or paper filter. If you use a metal filter in your drip maker, you may be surprised at how much more particulate is in your cup. I don’t want to present this too strongly. It was never truly objectionable to me, but I generally prefer a cleaner cup – my preference, and by no means universal. If you want a steeped cup minus the sediment, may I suggest the Aeropress? Speaking of grind, you’re probably wondering what grind I used. I tried various grinds, possible since there’s not plunger to get hung up on and the cylinder’s laser-cut holes are quite small. I ended up preferring a slightly coarse grind, the same as I use for a Chemex. The Sowden SoftBrew is certainly an innovative product. If you like the press pot, but find it difficult to clean and want a beautiful way to brew and serve coffee for a two to four people, it might be a very good choice.